The second member of the Numbers was designed while having in mind the need to produce a unit capable of performing long-term infiltration missions in an independent fashion. Her 'IS' allows her to reshape her body's appearance and is especially calibrated to deceive the usual inspections made over one's self in most of the TSAB-administrated worlds. While in missions, her status quo is a classified information even among the other Numbers and the only ones who knows about it are Jail and Uno. Scaglietti's influence over Due is the strongest among the Numbers. She was Quattro's mentor, who inherited many traits of Due's psyche and personal ambitions as a result of the time that they spent together. After the completion of her long-term missions in stealing the Shroud of the Saint King and assassinating the TSAB High Council, she looked forward to be reunited with Scaglietti and her sisters, especially those designated with numbers 6 to 12, who she had never met before. 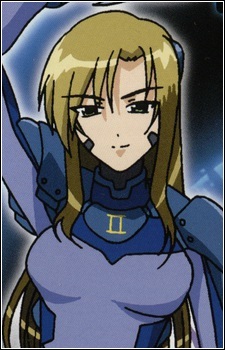 In episode 24, she is killed by Zest after killing Regius. In the SSX Sound Stage, she is referred to by Jail, who asks the TSAB to give her a decent burial in return for his services towards the Bureau in the sound stage.